We are a few hours of Sharm el Sheikh, the heart of the Red Sea. 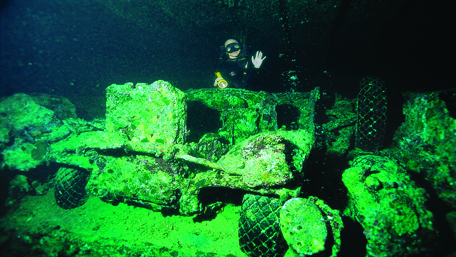 The Thistlegorm was discovered for the first time by Captain Jacques-Yves Cousteau who published a book about it without giving its exact location. 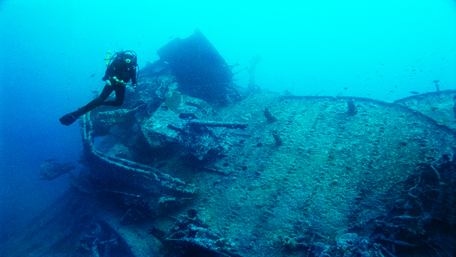 It was only in the 90s that divers were found by pure chance on the deck of the Thistlegorm and brought back to our memory the story of a great English ship. 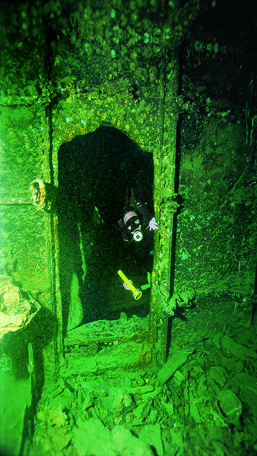 We are on the scene, exploring the wreck where it seems we hear the captain’s voice telling us the events of his trip which resulted in a tragic outcome. A ship with a precious cargo protected by two guns of the First World War. I’m William Ellis, captain of the SS Thistlegorm. Built in 1940 by Joseph Thompson & Sons in Sunderland for the commercial transportation company Albyn Line, the Thistlegorm was requisitioned by the British government to “help the war effort.” It is then equipped with antique cannon 4.7 “and a large caliber machine gun. I protest. How to defend against the Germans with two weapons from the First World War? In vain, “there is a shortage of material, “they answered me. Iam resigned. May 1941, the British government assigned me a mission of high priority: resupply the 8th Army based in Alexandria, Egypt, with much expected provisions: anti-personnel mines, shells, ammunition, weapons, Bedford trucks, armored cars, Ben Carriers, BSA motorcycles, trailers, spare parts of vehicles, aircraft, spare parts of airplanes, radios, rubber boots …Our company, Albyn Line, jumped at the chance and opportunity to send a shipment of two locomotives at the Egyptian Railways. A team of nine soldiers from the Royal Navy was assigned to us to handle our weapons…. 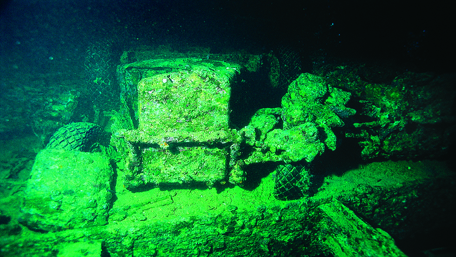 June 2,194.Thistlegorm lifts up finally anchor at Glasgow. I must first, with my crew secretly join a convoy off the south coast of Great Britain. Germany and Italy closely monitor the Mediterranean and its airspace. Impossible for the train to take the shortest way, too dangerous! We are then forced to make a detour of19.300 km by South Africa towards the Red Sea, through the Suez Canal and reach Alexandria.September1941 We arrive off Sha’ab Ali. We cast off the mooring F awaiting our turn to cross the Channel. 5 October 1941 It’s been two weeks since we wait. Permission to go depends on several factors: the enemy air activity over the Canal, the importance of the mission and the waiting time. But a collision between two ships blocked the entrance to the canal. 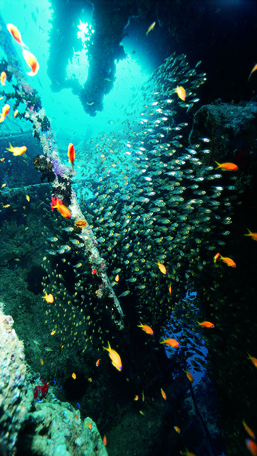 A bench of “glassfish” taking refuge in the bowels of the wreck. 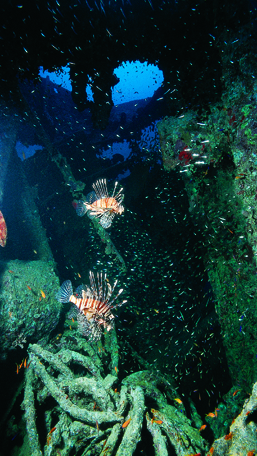 Resting 30 meters deep, the Thistlegorm has become a true living museum…Reef, grouper, tuna, “glassfish”, “lion fish” and many other species have found refuge. Two” lion fish” watching their prey. Their darts contain a deadly poison to humans. Refrain from touching them! 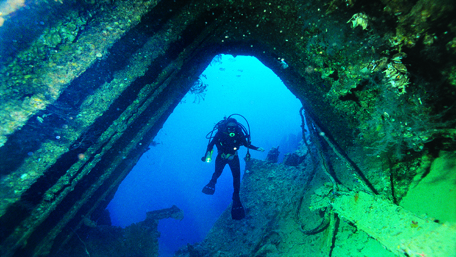 Average visibility of 30 meters, wreck in very good condition and rich fauna make this ship, nicknamed “The Mighty Thistlegorm” one of the finest dive sites in the world. 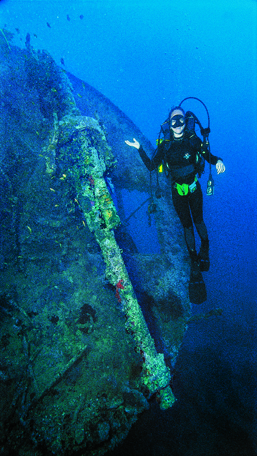 Jacques-Yves Cousteau had brought to the surface as evidence a motorcycle and the bell of the ship. The steer age of the ship is a maze…Each room hides a treasure. A trip back in time, an unforgettable experience.